If you’ve been around NetApp DataONTAP for a bit, you might remember the old 7-Mode Volume SnapMirror Interoperability Matrix. There was a specific document, and the information (table - which is in an Appendix below) could also be found in the 7-Mode documentation. This table does not exist for ONTAP (not that I’ve seen, if anyone has seen an official one, please let me know) - there might be a good reason why. Anyway, someone was asking me about this, so I thought I’d knock up an unofficial one myself. Since I’m lazy, I’ve not bothered with 32-bit and 64-bit aggregate considerations, 64-bit aggregates are assumed (and the only possibility starting from 8.3). (ii) 8.0 to 8.1 SnapMirror (with cDOT) is not possible due to a change in the Block Replication Engine. (iii) Excepting 8.0, the simple rule with BRE and ONTAP is that the destination must be the same major version as the source, or higher. (iv) Proof of 8.1 to 9.1 Volume SnapMirror is in an Appendix below. 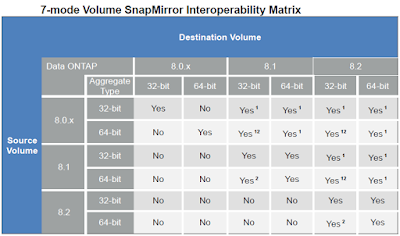 (ii) XDP SnapMirror only exists from ONTAP 8.2+. (iii) SnapMirror Unified Replication/Version Flexible Snapmirror; this came in at ONTAP 8.3, and requires XDP type SnapMirrors. (iv) Proof of 9.1 to 8.2 SnapVault is in an Appendix below. (v) You might be thinking “looks like Version Flexible SnapMirror came in at 8.2”, but this is not true since you only had “vault” type XDP SnapMirrors in 8.2, whereas 8.3.2 - for instance - has “vault”, “async-mirror”, and “mirror-vault” type XDP SnapMirrors. Note: Actual tested versions are 8.1.4 and 9.1. Note: Actual tested versions are 9.1 and 8.2.3. Very, very useful! We have been trying to find an "official" table with this info (sm and cdot) as in the past with 7m, but as you mention, it doesn't exist anymore. So, thanks! I have discovered that - officially - NetApp Engineering do not support SnapMirror from 8.2 -> 9.1 - basically, this means that it's not been QA'd. So SnapMirror from 8.1 -> 9.1 say, whilst it works, is not officially supported (could try the FPVR process if absolutely essential to get support) and you'd be using it at your own risk. very nice. We are in a situation where we are running 8.2.4 7-mode and need to get a new unit for a transition and I want to snap mirror one-way from 8.2.4 to 9.x for a period of time before breaking the link permanently but it appears that's not an option? Hi, snapmirror relationship compatibility, does it mean that you can recover and use data on the destination ? Example : an isci lun on a 9.0 cluster can be replicated to a 9.2 cluster, but could we use the lun replica on the 9.2 cluster ? Absolutely. A LUN is just a file to NetApp, and you can definately recover files on a 9.2 destination. I've not had to try restoring a 9.0 LUN on a 9.2 system but I'd be stunned if it didn't work.